Why should we replace hardware that still works? As a managed service provider we make recommendations to replace hardware proactively as it ages. We typically recommend replacing desktops, laptops and servers every 3 to 5 years. Oftentimes our clients ask "why should I replace my server when it's working fine?" This is a legitimate concern and we can see why one would think this. Why should they replace hardware when it still works? The problem with that mindset is that the server works - until it doesn't. The picture below is from a raid controller on a server. This card is what creates redundancy on the server with multiple hard drives. If one drive fails the other one or two pick up where that one left off. This is a really great idea, and is assumed on all servers. 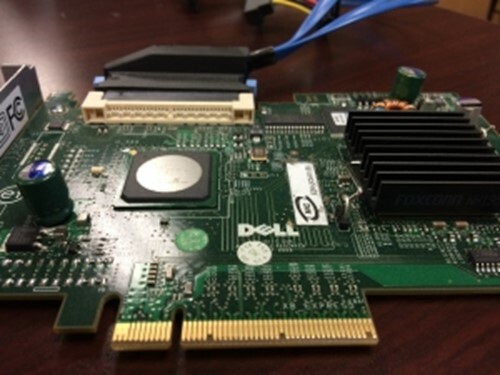 Every server that we have configured over the last 10 to 15 years has had a raid controller. In this case this card was from a server that was aging and should have been replaced. One drive failed, and the other one should have picked up where that one left off. The problem is that the hardware failure not only occurred at the drive itself but at the controller card. If you look closely you'll see those little cylinders. Those are capacitors and they have a slightly domed top. As I said before this hardware worked fine. Until it didn't. There was absolutely no notice that there was an impending failure until it quit. Even though the server had a good backup, the hardware failure can really cause chaos in the office due to the system downtime, and the time that it takes to get new hardware shipped and installed. This is not an ideal situation. Why do we recommend to replace hardware on a regular basis, and also why do we recommend to keep servers under warranty as long as they are in use? Because they work – until they don't.